A little over a month after the PSA Group confirmed that its Citroen brand would be the vehicle of re-entry into the India market, today the top management of the French carmaker took the covers off the C5 Aircross SUV in Chennai. The C5 Aircross, which is based on Groupe PSA’s EMP2 platform, will be the company’s first launch in India as a BS VI-compliant product and will go on sale before the end of 2020, with annual production capacity of 100,000 units from the Thiruvallur plant in Tamil Nadu in Phase 1. Present at the press conference for the announcement were Carlos Tavares, chairman, Groupe PSA, accompanied by Linda Jackson, CEO, Citroen Brand, and Emmanuel Delay, executive vice-president and head of India-Pacific, Groupe PSA. Speaking at the media meet in Chennai, PSA Group chairman Carlos Tavares said that the Group’s overall strategy is to become more global and increase sales outside Europe by over 50 percent. This involves launching the Peugeot brand in North America, Opel in Russia and Citroen in India. Exports of made-in-India Citroens will play a big role for the PSA Group to achieve economies of scale to justify localisation of over 90 percent from the start of production. This will involve a very high 98 percent localisation for the vehicle and 90 percent for the C5 Aircross engine. What will help the company achieve this high level of localisation is PSA’s two joint ventures in Tamil Nadu with the CK Birla Group for vehicle assembly at Thiruvallur, and a powertrain plant with AVTEC, which was inaugurated on November 22, 2018. The initial manufacturing capacity of this state-of-the-art plant will be about 300,000 transmissions per annum and 200,000 units of BS VI-compliant engines. The plant will manufacture gearboxes in Phase I to support both the India project as well as supplying Groupe PSA needs. - A strong and differentiated product offering, bearing a unique design and benchmark comfort, which creates value for customers to stand out in an already highly competitive automobile market. - Price positioning at the core of the Indian market, using a strategy with a high level of local integration (over 90%) based on the two joint venture agreements between Groupe PSA and the companies of the CK Birla Group (car assembly and distribution, and production of powertrains). Citroën will release a range of new models, with an international scope, for the first time in India, the first of which will be launched by the end of 2021. Fully in line with the framework of the Groupe PSA Core Model Strategy, these new models will follow its principles, in particular with one launch per year. Comfort: a feature of the Citroën experience via well-being on board and ease-of-use for all occupants. Clever: with reference to the intelligent design and the high level of local integration in order to perfectly meet the core market needs. After India, other areas of the world will benefit from these new international models. Before their launch, the brand will begin its offensive in India from 2020, by introducing its flagship, the new C5 Aircross SUV. This time around, PSA, which has had a not-so-good experience in its India ventures in the past, is focusing on building the business profitably. By manufacturing both the engine and transmission locally for its India models, Citroen will get a sizeable cost advantage over other global carmakers in the country. The French carmaker doesn't have a 'first-mover advantage' to enhance its chance to succeed in India but it is betting on the "advantage of studying our competitors and the reasons for the failures" in India. "Huge investments, unrealistic volumes" are some of the reasons. As part of its India market strategy, PSA has made a business case to be profitable with just a 2 percent share of the passenger vehicle market. According to Emmanuel Delay, executive vice-president and head of India-Pacific, Groupe PSA, “Our ambition is to achieve a 2 percent market share within 4-5 years. Our business case is in line with expectations, not dependent on a massive expectation like 5 percent". Emmanuel Delay commented, "India is a tough market where nothing is certain but also nothing is impossible. We want to build a full ecosystem to be 'Indian in India' and leverage India as a cost-efficient market." With 1.3 billion inhabitants, India is the second most populated country in the world. It is also the youngest country in the world, with a median age of 25 years old. By 2025, 55 percent of the country’s population will be of working age, which equates to 25% of the active global population. With levels of growth among the strongest at present, India may well become the leading global economy within a few years (it was fifth in 2018). In terms of the automobile industry, India represents excellent potential. With a current ownership rate of only 40 cars per 1,000 inhabitants and a middle class that should grow by 75 percent by 2025 (going from 63 to 110 million), the average growth of the passenger vehicle market in the years to come is estimated at 8% per year (going from 3.3 million units in 2018 to over 6 million by 2025). Therefore, from 2020, India should be the third largest global automobile market behind China and the United States. PSA and Citroen are looking to make the most of the global consumer demand for SUVs, which is why the C5 Aircross is its first weapon of assault. This SUV debuted in April 2017 in Shanghai, and subsequently went on sale in many European markets. 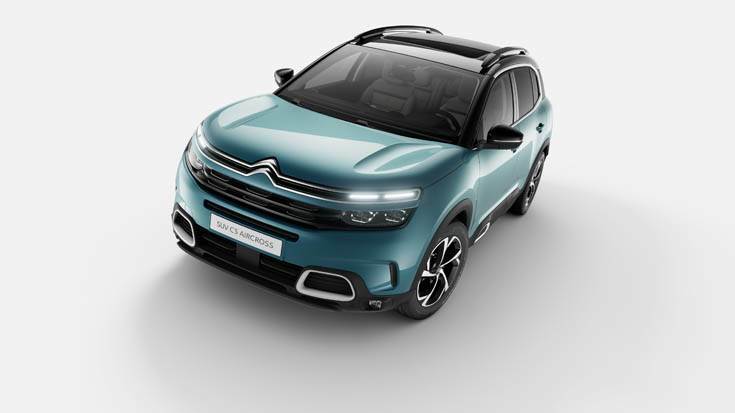 The C5 Aircross is based on Groupe PSA’s EMP2 platform that also forms the basis for the DS 7 Crossback, the Peugeot 3008 and the Vauxhall Grandland X. The Citroen C5 Aircross is 4,500mm long, 1,840mm wide, 1,670mm tall and has a 2,730mm wheelbase, which makes it 25mm longer and 10mm taller than Hyundai Tucson, with a wheelbase that is 60mm longer. It sits rather high up too, with 230mm of ground clearance. A funky, modern looking two-tone dashboard is the centre-piece of the C5 Aircross’s cabin, replete with split air-con vents that look unique. It’s loaded with features, too, with the SUV including multiple airbags, blind spot assist, smart headlights with an auto high beam feature, attention assist, cross-traffic detection and hill-hold assist, among others. The interiors also feature an 8.0-inch touchscreen infotainment system, automatic climate control, steering-mounted buttons and an all-digital instrument cluster. Abroad, Citroen offers the C5 Aircross with one petrol and two diesel engine options – a 130hp, 1.2-litre turbo-petrol, a 130hp, 1.5-litre turbo-diesel and a 180hp, 2.0-litre turbo-diesel. Transmission options include a 6-speed manual and an 8-speed torque convertor automatic. While all-wheel-drive isn’t on offer, the C5 Aircross does have Grip Control, a feature similar to the Terrain Response modes found on the Tata Harrier, and hill-descent control. All Groupe PSA models – including the Citroen C5 Aircross – will be manufactured at the CK Birla Group plant in Thiruvallur, Tamil Nadu which also manufactures SUVs for Mitsubishi in India. Citroen is also set to offer a plug-in hybrid variant of every new model based on PSA’s EMP2 platform and also an all-electric variant of all new cars based on the CMP architecture. Expect Citroen C5 Aircross prices in line with like-sized rivals. PSA boss Carlos Tavares has already stated Citroen will start operations in India with above 90 percent localisation, and this should reflect in competitive pricing for the C5 Aircross. The Indian passenger vehicle market has just seen the entry of yet another challenger brand. Kia Motors and MG Motor India will roll out their first products for the domestic market. Stay tuned for more action as India's passenger vehicle market gets even more exciting.